Been sick since returning from my travels to Romania and England last week. I was so anxious to be back in my own bed again, only now to be confined to my apartment around the clock. (It’s just a bad chest cold, and I think it’s finally turned a corner today). It’s occurred to me that one of the things that keeps me from updating my website and blog more regularly is a gnarly bent towards perfectionism. I slave away for hours over a couple of paragraphs because I want them to be profound, well constructed snapshots of my life. The obvious problem here is that is my life is neither well-constructed, nor profound. Case in point: I began my trip by missing the one and only train from Sarajevo to Budapest, and finished it by missing my flight from England. (I went to the wrong airport!) So why pretend to have it together? The Romanians captured my heart again with their warmth and affection. They have a gift of making everyone feel like a part of the family. England, on the other hand, takes your breath away with it’s beauty and style. Both countries reflect a unique aspect of God’s glory. 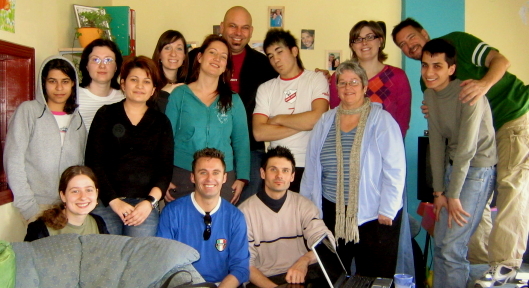 The English school was my first chance to teach for a whole week on the kingdom. Typically I do three days on Biblical Worldview, and then spend two days developing the worldview of the Kingdom. It’s a good study in contrast between the death and destruction of (for instance) Communism, Postmodernism, and Islam, and the beauty and life of the Kingdom. But this time I had a whole week to develop the glories of the kingdom. Wasn’t sure, at first, if I’d have enough material. But by the week’s end I was wishing for more time. So… today the sun is shining in Sarajevo, my cold is beginning to break, and I plan on getting out of this stinking apartment and meeting some friends in town for coffee.